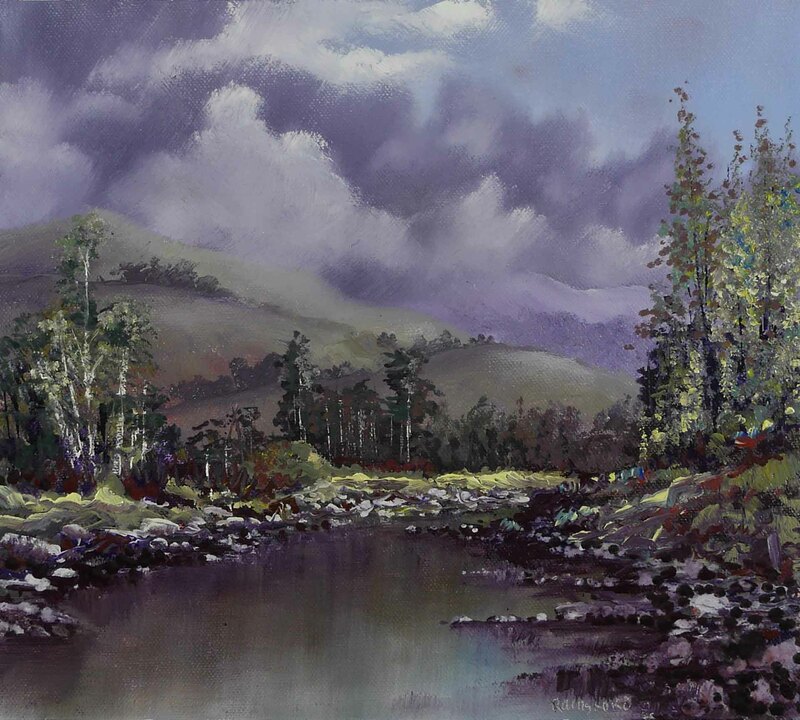 Another small painting of a quiet stretch on The King’s River in County Wicklow. Its a lot cooler here in the higher altitude, in spite of the sunshine, with a definite look of the approaching winter. I’m using the edge of a painting knife to get the really fine lines on this small painting. I generally prefer to use a brush but these lines needed to be so thin and painting onto a wet background made it practically impossible. When I do use the knife I will try and disguise the mechanical look produced by the sharp edge. With so little control, after placing the paint I have to repair the damage inflicted on other parts of the painting by dragging the under-colour to cover up. Its easy when painting trees as foliage usually can be placed on top as well. This painting uses only 4 colours (Winsor Lemon, Indian Red, Dioxazine Purple, Cobalt Blue) plus black and white. There is no medium used, only White Spirits. This entry was posted in Oil Painting and tagged Art, Culture, Education, Inspiration, Irish landscape, Oil Painting, Oil Painting Instruction, Oil Painting Landscape, Pictures, Time lapse painting. Bookmark the permalink. There’s something different in the look of this painting when I recall others, just as handsome but different somehow. Could it be the use of the knife? Since changing my Theme, notifications of some blogs, yours included, have disappeared. I haven’t solved this yet so have been missing out and need to catch up. Thanks Rosie. A limited palette forces concentration on the possibilities.